The group of four written in Washington DC, June 2016 is the sequel to Sitting II, and the prequel to Mind Control. There are no books to prepare you for this. It doesn't come with an instruction manual. There are books and instruction manuals to prepare you ie to get you ready for doing. But when it comes to matters of being, there's no getting ready for it. Why not? Because you're already ready. Actually you were born ready for being - even though it may not always look like it or feel like you are. And if you did read a book or a manual to prepare yourself for being and it worked, you may have already wised up by asking yourself "Did I start being, as a result of the book ie as a result of reading the manual? Or did I start being, because after all was said and done, I put away the books and declared I'm being?". I assert the best books and the most explicit manuals, if they're what they purport to be, will affirm the latter. I have a long, rich history with my children - as we all have with our children. And the thing about history (even a long, rich one) is by definition it's in the past. Listen: it's very difficult if not outright impossible to really be with people when you're relating to them from the past. Yet in spite of myself I notice I'm inclined if unchecked, to relate to my children in some ways ie in some roles which are all from the past. To be clear, it's not a bad thing to relate to children in roles which are from the past. For example, I'm inclined to relate to my children as their decider, their provider, their guide, their protector, and even (on occasion) their dictator. There's nothing wrong with any of those roles, even if all of them are from the past. There's something else actually: it's because of them, my children have turned out great. Really they have. That said, those roles just aren't apropos anymore. They're dated, obsolete, they're ancient history. 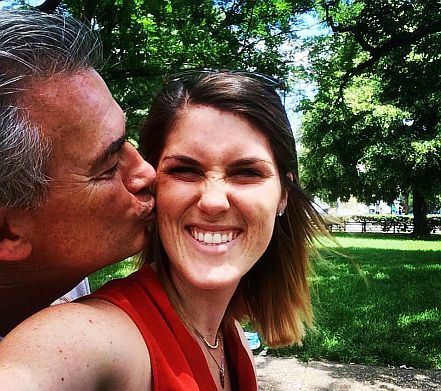 I'm visiting my daughter Alexandra in her home city of Washington DC for a week of birthday celebrations (mine). The opportunity for me is the enjoyment of hanging out with someone I really admire, someone I respect, someone I enjoy being around. If she wasn't my daughter and I met her in any other situation, we would have become friends anyway. Having left our past in the past where it belongs, what's become available for us, is being with each other now and not having the past determine what's possible for us. When I realize this, I get what my starring role is in this play: it's simply to be around her in love and in friendship unconditionally. It's a role which sets a high bar for being, for what's possible with my sons too, with my extended family, with my close friends, as well as with all of you and with all people everywhere. We see and do a lot together in this all too short week. We tramp Washington DC's sidewalks flat over miles and miles and miles day after day after day in over ninety degree heat and humidity. But the weather is simply the background for us. It's not the main event. The main event is secondarily all the great things there are to see and do in our nation's capital. Yet none of what's here for us is about the doing. It's primarily about the being. Being has been a centerpiece of my life for at least the last forty years. It's not central to everyone's. Not everyone wants it to be. She's one for whom it is, a trait I recognize ongoingly - therein lies our affinity. The historic roles of father and daughter have disappeared into the past, leaving room for the being of two human beings to emerge - and with it, the being of all human beings. She's already a world traveler, having pursued an extensive international academic program. Outside of that, she's always lived at least driving distance away ... except for now. Although it's natural for me to have concerns about how my children are doing, being here with her I realize I can give them all up (which, by the way, is a gift she gives me). The space once occupied by my concerns for her, is now filled with pure admiration. It's the kind of admiration I'd have for anyone I suppose who builds a great life for themselves. The fact that it's my daughter we're talking about, doesn't alter the equation. She arrived in a new city by herself, took on a new job, and put all the pieces in place to live a great life, a life she loves. It's not an easy thing to do, let alone be great at. Yet that's exactly what she's done. She's my hero.